There are tax incentives available for improving the energy efficiency of your historic building. Not only could your project qualify for a historic preservation tax credit, but it may also be eligible for federal income tax incentives for energy efficiency. Learn more about these credits from the non-profit Tax Incentives Assistance Project. 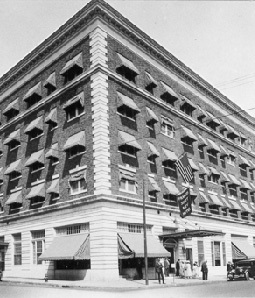 Awnings shade the windows and storefronts of the Francis Scott Key Hotel in Frederick, Maryland, in this early 20th century view. Historically, awnings and trees provided shade to keep buildings cooler in the summer. Existing awnings and trees should be kept in good condition to take advantage of their energy-saving contribution. Building owners may consider adding awnings or trees if the summer cooling load is substantial. Awnings are appropriate where there is evidence that they existed historically and on building types where they were common historically, such as commercial buildings with storefronts. Awnings should be installed with care to avoid damaging the building or visually impairing its architectural character. 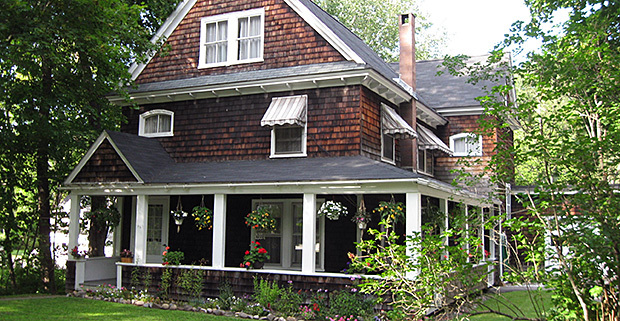 Select an awning style that is compatible with the historic building. Planting trees can be an effective alternative to installing awnings. For south-facing elevations, select deciduous trees that provide shade in the summer and, after dropping their leaves, allow the sun to warm the building in the winter. Trees should be planted at least 10 feet from a building to avoid damage to building foundations. Adding either awnings or shade trees may be expensive, but in hot climates, the benefits can often justify the costs.